I love photography and want to share what I know. 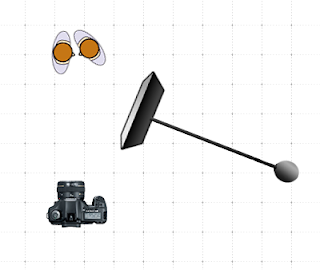 Hopefully it will help make you a better photographer whether you are a professional or a complete amateur! 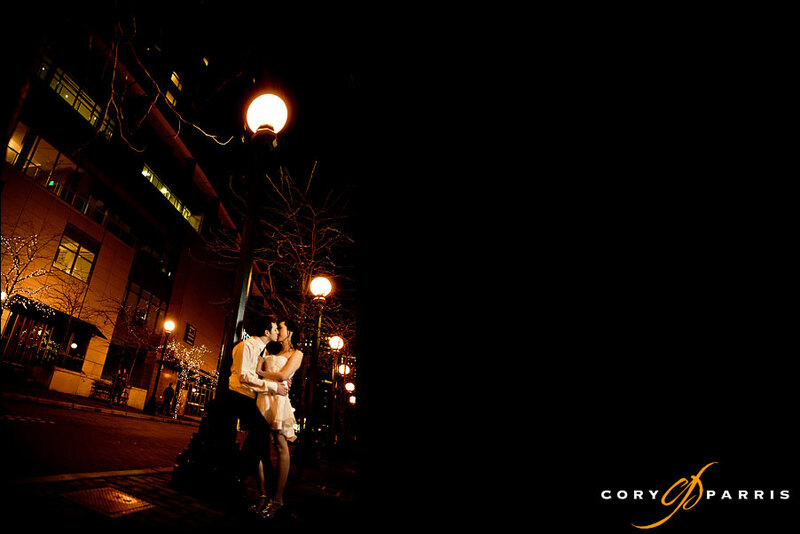 Last weekend I took some photographs of Jane and Chris on their wedding night outside the Westin in Bellevue. Here is one image. This image was taken with my Canon 5D and a 24 1.4L. I was crouched very low to the ground and took a "creative" approach to a level horizon. I had my lovely assistant, Alyssa (also my daughter) hold a 550EX with a 24" square softbox attached to a pole. It was high and camera right of the couple. It was set to eTTL wireless (using Radiopopper PX system) triggered by my Canon ST-E2 with -1 2/3 flash exposure compensation dialed in on the camera to keep the auto system from trying to light the entire street. Here is a diagram. This is courtesy of LightingDiagrams.com. Composition - Bend Your Knees! Gear Review - Canon 24 1.4L! I have to start by coming clean. I’m a geek. I love stuff, electronics, gear, and feel out of sorts if I’m not in possession of the remote control (preferably matched up to a nice HD TV). When I complete my taxes and it asks for my position at the company, I write in “Photogeek in Chief”. So…I love photo gear. With a rather unhealthy passion. That being said, I also used to be a Finance Director for a small non-profit. That means, there has to be a reason for every purchase, and the reason has to be more than “I REALLY want it!” (say it in again your head with a nasally whine, it will sound more realistic – “I REALLY want it!”). -How does it help me create better photographs, and does it let me do something that my current gear doesn’t allow me to do? -Will the difference that this piece of gear will bring to my photography allow me to increase my sales and profits? This usually takes the form of allowing my to create more dynamic work and increase the demand for my services. -Will the new piece of gear inspire me to create new and better work? A common thing that happens with gear for me is that it will make me find new ways to use that particular piece. That, in turn, gets me to use the gear in different ways than I normally do. -And finally, is it cool? Of course it’s cool, otherwise I wouldn’t have wanted it in the first place! Once I have all that information, I make a presentation to my Chief Financial Officer. More commonly referred to by myself and others as “Leslie”, or (mostly by me) “hey, beautiful wife". “Oh. No…” says the Chief Financial Officer. “…and I’m thinking…” says the Photogeek. “You know your going to buy. Just do it now instead than worrying about it for a month!” says the beautiful, loving CFO. About a month later, Photogeek buys said piece of gear. My first toy that I’m going to talk about is the Canon EF 24mm f/1.4L. This may be my most loved lens, and that is really saying something. I use this lens constantly. It makes up about 40% of all the images in my portfolio. I should mention that I use a full-frame camera, so this quite a wide lens. Here is a photo of the lens itself. (Lovely studio product image taken with a couple of small Canon strobes and a piece of white posterboard). It is a medium sized, but very dense, rather heavy lens. It is a polycarbonate body that can take some abuse. You can see some signs of past little incidents on the lens hood. I think the lens hood is actually designed to show every time it’s touched by anything. I have the version one of the lens, but there is a version two out. If you look at my criteria for buying above, I can’t come up with a reason to sell my version I and get a version II. This lens has the rather unique characteristic of being both a wide angle lens and having the ability to have very shallow depth of field. If you don’t know what depth of field is, you can look below and see how the subject is sharp and the background is blurred and out of focus. That is called shallow depth of field while if everything was in focus, that would be a deep depth of field or greater depth of field. Another great benefit is the amazing low light capabilities. To give you an idea, with each full stop, the lens cuts the amount of light in half. This lens has an aperture of 1.4 which allows you to take images in one-fourth of the amount of light of a lens with the aperture of 2.8. Now for what everyone wants to see…the samples! This is an excellent example of what this lens can do. This couple was married during mass at Blessed Sacrament Catholic Church in Seattle. Because the couple was married during mass, they did not know most of the people around them. I wanted them to stand out from the crowd, so I made this photograph with a shallow depth of field with the couple sharp and the surrounding background soft. This smart groom is watching his waistline on his wedding day. This is another example of the sharp subject and shallow depth of field that I love from this lens. Groom waiting for his bride to see her for the first time that day. I love the sharpness on his face and the out of focus detail of the bride coming up behind him tells the story. With this image, I used the 24 and a smaller aperture to make the clouds and background sharp. I also used a flash to light up the couple. This image was taken from a viewpoint at the Olympic Sculpture Park. I used the shallow depth of field the 24 1.4L creates to make the background beautifully out of focus. Another image using the shallow depth of field to make the groom stand out. This image uses the great light-gathering of the 24 1.4L. I have decided to resurrect this old blog. I really do love sharing what I know, so I'm going to see if anybody is out there listening! To start, here is a simple image taken in a parking garage. The flash is set high and to the left to with a Honl grid spot to put them in a spotlight style pool of light. I underexposed the ambient light to have the pool of light feeling stand out more. I hope to hear from you with questions and comments about my work and the blog! Check out more of my work at my Seattle Wedding Photography portfolio site! I am Seattle wedding photographer that loves photography and teaching. It is my goal to help amateurs, aspiring professionals, and even the occasional full-time professional become better. Let me know how I'm doing!